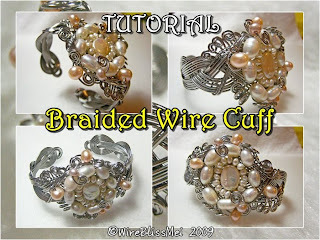 The Tutorial for this braided wire cuff was in my to do list for quite a while. For those who has been asking, I hope you are still interested even after the long wait. Although I categorized it for Intermediate to Advance level, I am very sure a beginner would be able to execute this without problem because the tutorial is written in easy to follow steps and instructions right from the beginning till end. This is made easier with clear and close up pictures of the steps involved. 432 cm (170 in or 14 feet) of 20ga wire. 100 cm (40 in or 3 feet) of 28ga. Beads or Pearls of various sizes. Personal preference. Tools: Round nose, bend nose, nylon jaw pliers, wire cutters, spring or adjustable clamp, masking tape, bottle for mandrel, marker pen and ruler. This is gorgeous Mei...far beyond my capabilities when it comes to wire work!